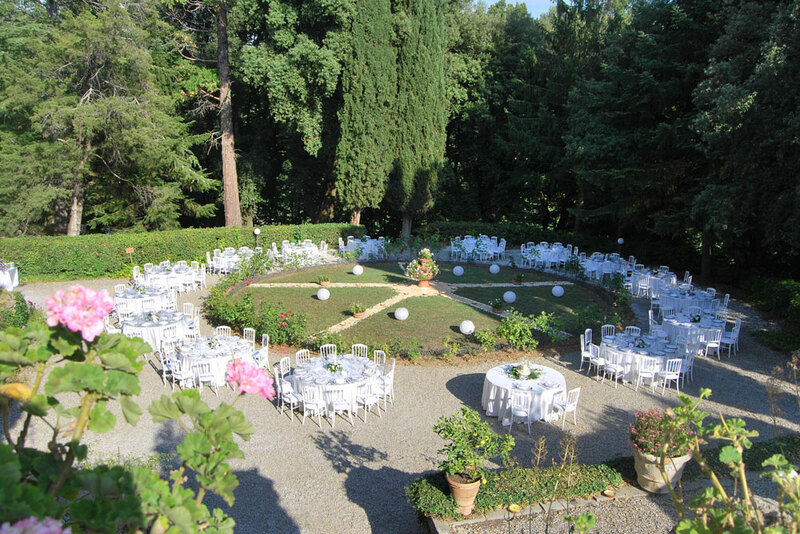 The Villa di Striano is always exclusive and it is the ideal place to organize all the moments of your “wedding day” from ceremony to the aperitifs, to the lunch or dinner with different kind of service up to the dance party with cocktail bars managed by real professionals. Hidden in the hills of the Mugello offers an unforgettable sight that will be the perfect setting for your “best moment”. The Villa has numerous and versatile environments that can be used differently according to the logistics of the event: the outdoor gardens are the setting for the most important moments of the wedding, from the ceremony to the after lunch or dinner. The lounge is furnished with original furniture and ‘ 800 paintings, and Terrace of Artists, provide an excellent alternative in case of bad weather, even for receptions up to 250 people. Personalized wedding receptions with a professional wedding planning service that will take care of every single moment of your Day. We will take you on the choice of catering and Mise en Place, the creation of the menu and the wedding cake. Each additional service to your wedding will be carefully designed and we will examine together the infinite possibilities. You have only to enjoy yourselves. Unique installations that make the atmosphere, from the ceremony to the centerpieces, from candles to fireworks. A touch of originality paying attention to details are the characteristics that make us different. Listening to your wishes will be our mission. Overnight accommodation for the groom and the bride in the bridal suite and for a maximum of 10 guests in the other rooms.